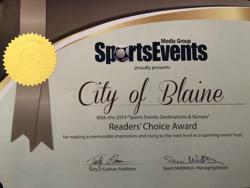 Blaine, Minn. (April 8, 2019) — The readers of SportsEvents Magazine selected the City of Blaine as Minnesota’s top sports destination, an award “based on high standards of professionalism and quality of service in hosting sports events,” according to information provided by the magazine. 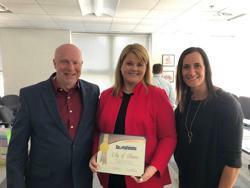 Al Stauffacher, Sports Marketing Director with Twin Cities Gateway; Julie Jeppson, Blaine City Council member; and Danielle Seraphine, Director of Wellness and Sustainability with National Sports Center. Each year SportsEvents asks readers to nominate the locales that exemplify the best-of-the-best in sports events during the current year. Nominations are received through an in-house survey of all readers and include comments, recommendations and details to help narrow down the field. The nominations are then presented through an online ballot. The mission of SportsEvents Magazine is to help planners of amateur sporting events and competitions be more effective, informed and successful with their events. The editorial content includes “how-to” type articles written by recognized authorities, news and information relevant to sports event planning, spotlights on destinations and sports complexes, interviews and profiles, and other items of interest to the industry.